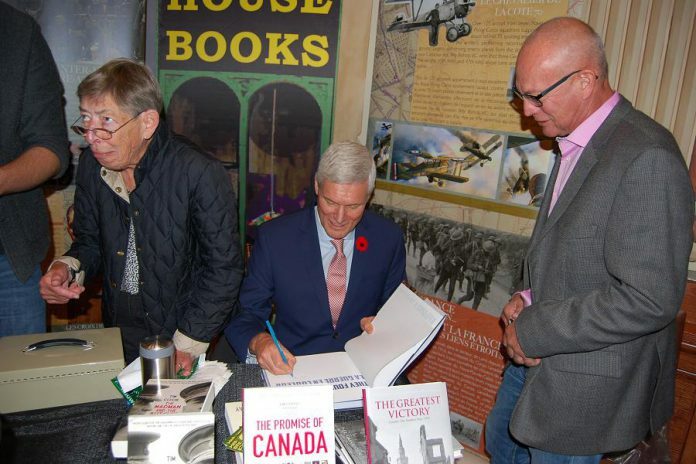 On Sunday, September 30th, Cobourg’s Victoria Hall hosted a VIP launch gala for Armistice 18 — a two-month commemoration by the Town of Cobourg of the signing on November 11, 1918 of the armistice that ended fighting in World War I (WWI) between the Allies and Germany. Historian and featured playwright Hugh Brewster was among the many people to address the crowd regarding the exciting things Armistice 18 has planned for the community. Event attendees included Northumberland-Peterborough South MP Kim Rudd, Cobourg Deputy Mayor John Henderson, and Port Hope Mayor Bob Sanderson. Guests were given a preview of scenes from two Armistice 18 theatrical productions (including the unique drama Last Day, Last Hour, set in the very room where it will be performed), an introduction to the exhibit of artist Charles Pachter (currently on display at the Art Gallery of Northumberland), and a general overview of everything else the Town of Cobourg has planned for visitors in the coming weeks. “My goal is to get school kids to come here [to Armistice 18 events] they need to experience this,” says Last Day, Last Hour playwright Hugh Brewster. Education and awareness are at the forefront of the initiative. A major goal of the program is to help new generations understand and appreciate the significance of Canada’s WWI soldiers and what was sacrificed in the name of freedom as we ramp up to November 11th, Remembrance Day 2018. “You have to understand how the world totally shifted during 1914 to 1918,” Brewster explains. Cobourg is rightfully proud of the program its developed for the centennial and, with a rich historical connection to the Great War, it’s the perfect town to honour the lives of fallen Canadian soldiers. 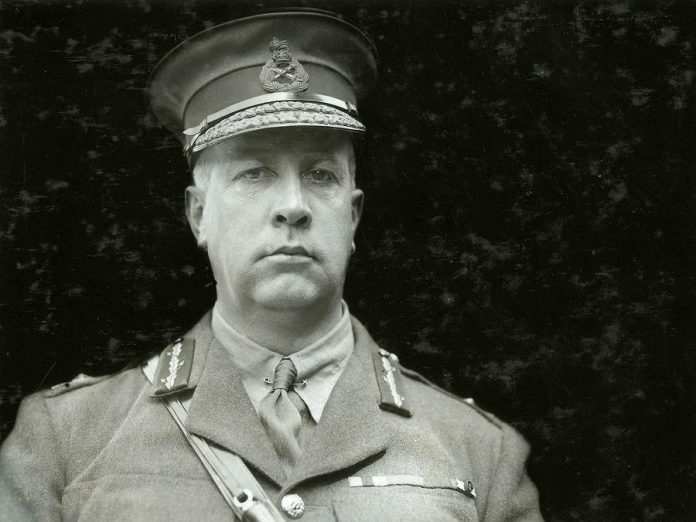 “What began as something much smaller, quickly grew to become the largest armistice event in the country,” says Deputy Mayor John Henderson, referring to Armistice 18. “Our council did not hesitate to put up $50,000 towards this. When you allow innovation in terms of the arts, culture and history, it’s amazing what can be done. It’s okay to make your community important with cultural events. One of the most unique experiences included in Armistice 18 will be Hugh Brewster’s play, Last Day, Last Hour – Canada’s Great War on Trial, about the 1928 libel suit brought forward by Sir Arthur Currie, Canada’s most illustrious general of WWI. After a front-page editorial in the Port Hope Evening Guide in 1927 charged that Currie needlessly wasted lives by sending troops into battle on November 11, 1918, the last day of the great war, Currie sued the newspaper for libel. Not only is this a newly penned play, but you can experience this historical exploration of the trial in the very courtroom where it all took place: the drama is staged in the Old Bailey Court Room at Victoria Hall where the Currie libel trial actually took place 90 years ago. “It all started with a discussion with Hugh Brewster about his play Last Day, Last Hour. Hugh was originally going to stage the play in Whitby, but the thought of having a reenactment of the trial that actually occurred in this building was very profound. It was one of Hugh’s dreams to see his play performed in this building. Gallery Director Olinda Casimiro will be showcasing the work of one of Canada’s leading contemporary artists, Charles Pachter, at the Art Gallery of Northumberland (AGN). Vibrant and colourful, Pachter uses flat colours to create bold, simplified images with his paintbrush — without infusing his war-themed paintings with the violence of war itself. Pachter, a historian himself, wanted to capture the First World War without focusing on the obvious violence of war itself. 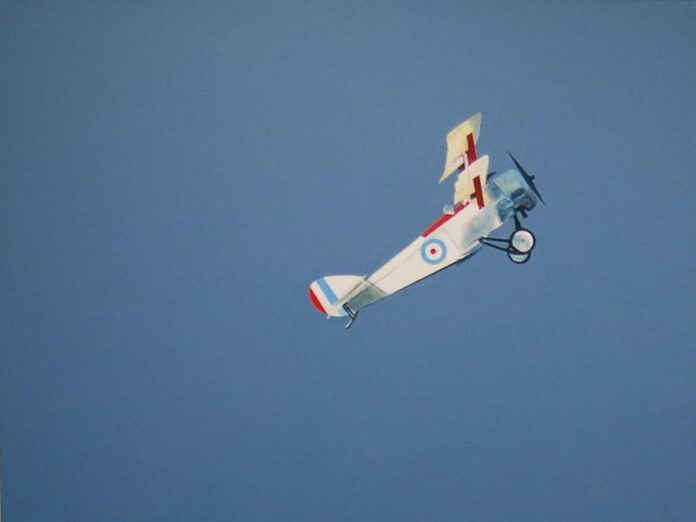 In one painting, a simple aircraft is flying high up in the sky on a field of blue — emblematic of the war, but very far from the trenches. Paintings such as “The Healers”, “Tank Top” and “Cortege” will be on display at the AGN during Armistice 18. Pachter will be leading a discussion on his work at the gallery on Saturday, October 20th at 2 p.m.
One of the centrepieces of Armistice 18 is the display of 40 panoramic photographs taken by Canada’s most prominent war photographer William Rider-Rider that haven’t been displayed since 1989. Pictured is one of Rider-Rider’s panoramic photographs from Library and Archives Canada, showing Canadian soldiers entering the Square in Cambrai, France in October 1918. The retreating Germans set fire to the town, but the rapid occupation allowed much of the city to be saved from the flames. Canada’s Hundred Days is a remarkable exhibit of war photographs and one of the most interesting Armistice 18 anecdotes. The discovery of more than 40 panoramic photographs taken by Canada’s most prominent war photographer, William Rider-Rider, happened just months before Armistice 18 as set to kick off in late September. 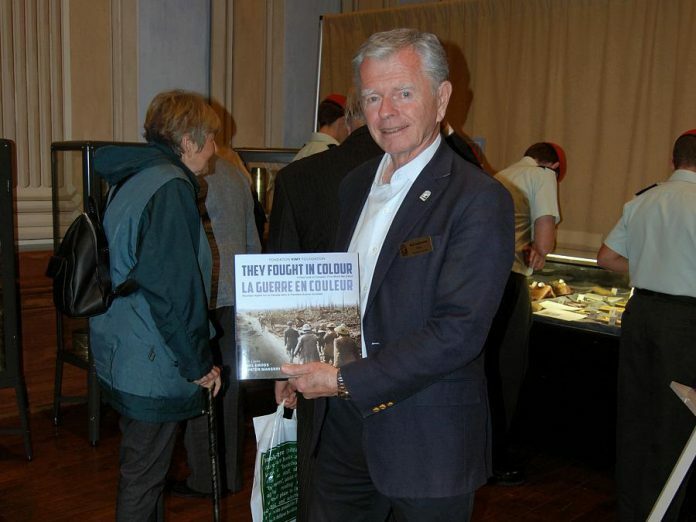 “This exhibit is one of the centerpieces of Armistice 18,” says the Town of Cobourg’s Dean Hustwick. 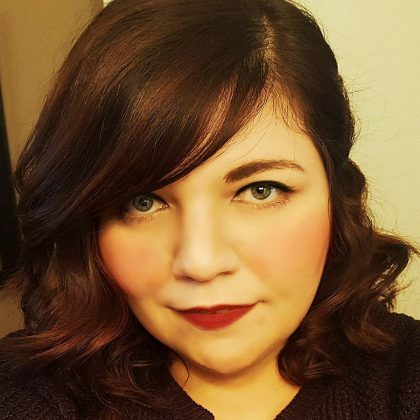 The Great War in Colour, sponsored by The Vimy Foundation, showcases colourized WWI photos that can be viewed at Victoria Hall or purchased as a book. If you find colourized war photos interesting, The Vimy Foundation is always looking for support to work with the National Film Board of Canada to create more colourized archival photos and film. If you would like to donate and support the Vimy Foundation, please visit www.vimyfoundation.ca. Trench Art and Trench Life is a fascinating exhibit that showcases objects created and owned by WWI soldiers from the collection of Garnet Barber, the Royal Canadian Military Institute, and family archives. How Can You Experience Armistice 18? During the months of October and November, there are many events scheduled in Cobourg. Whether you are interested in seeing a play, hearing a speaker, or taking a self-guided walking tour, Armistice 18 has something that should appeal to everyone. If you’re looking for something to do that is free and can be done at your own leisure, the Poppy Trail is a self-guided WWI walking tour in historic downtown Cobourg. You can obtain your free printed guide at Victoria Hall on weekends between October 14th and November 4th. 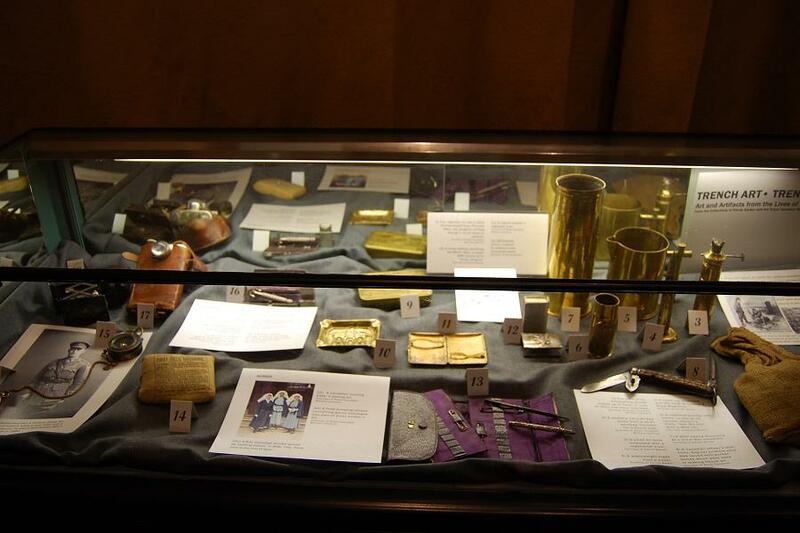 History and art exhibitions at Victoria Hall are ongoing from now until November 11th, and are open to the public Monday to Friday between 11 a.m. and 4 p.m. and on weekends from noon to 4pm. 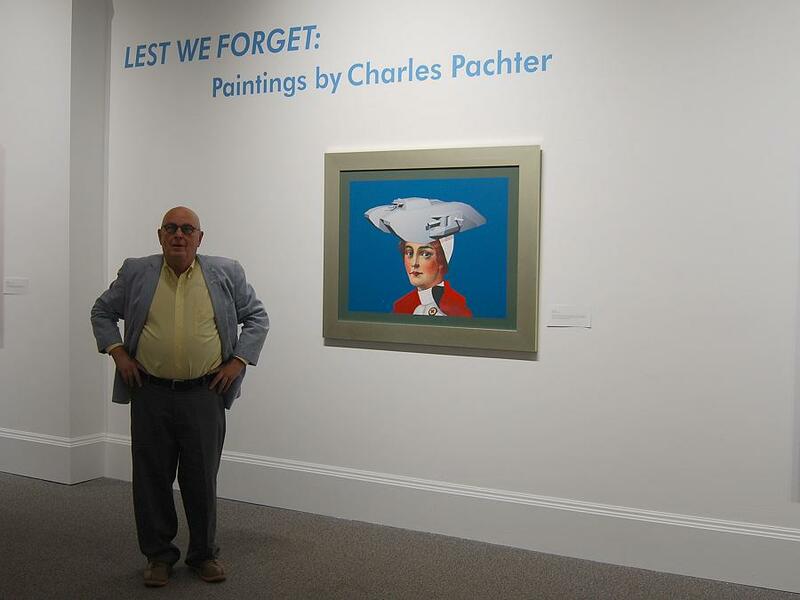 You can also attend a talk with Charles Pachter on Saturday, October 20th at 2 p.m. at the AGN. 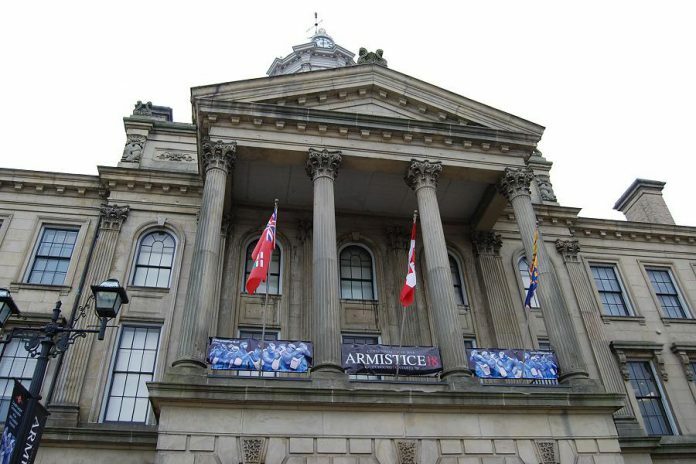 The Armistice 18 Speakers Series includes esteemed war historian Jack Grandstein on October 14th, Canadian War Museum historian Tim Cook on October 21st, and popular historical writer Charlotte Gray on November 4th. Theatrical productions include Mary’s Wedding at the Firehall Theatre, The Stars On Her Shoulders at Victoria Hall, and Last Day, Last Hour, also at Victoria Hall. For dates and ticket availability, please contact the Victoria Hall box office by phone 1-855-372-2210 or online at www.concerthallatvictoriahall.com. The Concert Hall at Victoria Hall is located at 55 King Street West in the heart of downtown Cobourg. Ask the box office about theatre/speaker packages while booking your theatre tickets. Armistice 18 runs in Cobourg from now until November 11th. To learn more and plan your itinerary, please visit www.armistice18.ca.